BROWNSBURG, Ind. 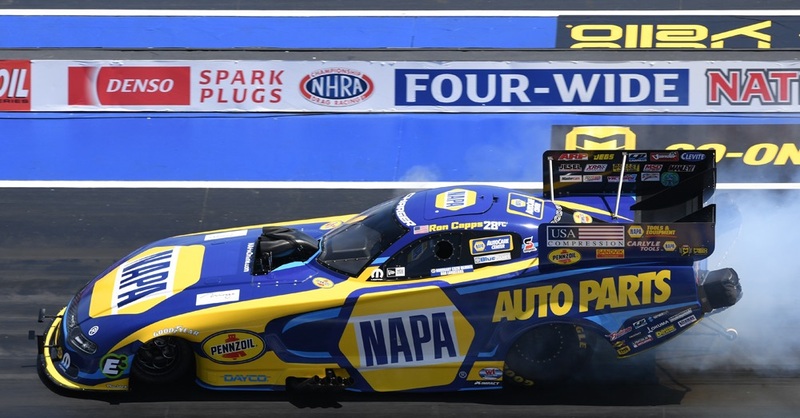 (June 10, 2014) – Ron Capps competed in a Nostalgia Funny Car match-race Friday outside of Indianapolis, and while it might seem like an odd way for him to spend one of only two off weekends within a 12-week span in the NHRA Mello Yello Drag Racing Series, it makes perfect sense to him. 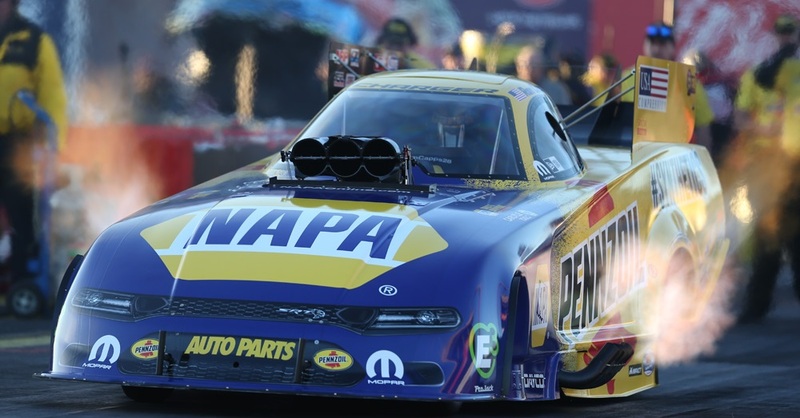 “Driving what I get to drive away from the Mello Yello Series always helps me,” said the resident of Carlsbad, Calif. “Luckily I’ve got a great owner like Don Schumacher who always has allowed me to venture out to race other things. He’s aware those experiences can only make you a better driver. Ron defeated fellow Mello Yello Funny Car driver Cruz Pedregon on both runs at Lucas Oil Raceway during a Goodguys event. The festive outing also was beneficial to his crew and others at Don Schumacher Racing. 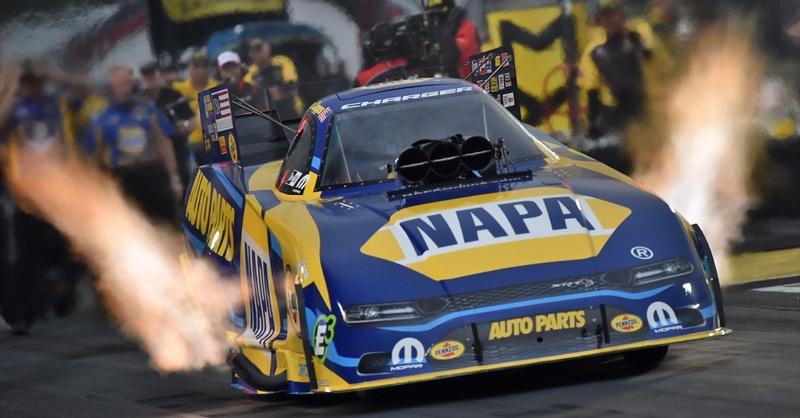 This Friday it’s back to the Mello Yello Series to start a four-week run of four races beginning this weekend at Bristol Dragway in Tennessee. 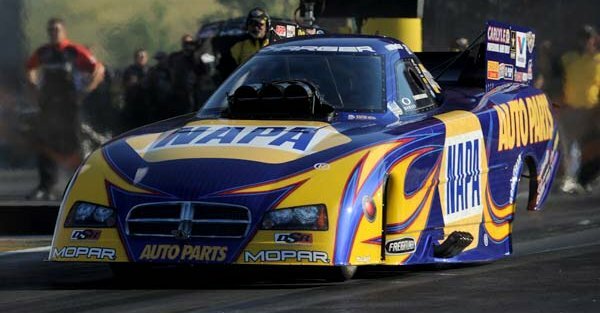 Ron ranks fifth with his NAPA AUTO PARTS Dodge Charger R/T team heading to the 10th of 24 events this season. “We’re getting to the time of the season when it starts getting very busy and these next four races can make or break a team. “We’re going to some tracks coming up where Rahn and I have had some success,” Ron said. That includes Bristol where Ron has won three NHRA Wally trophies (2012, 2006, 2001). “I’ve had great success at Bristol and love going there. It’s just a great place for me. “The sole focus for our team now is to keep chugging away and moving up in the points. When you have four in a row like we’re going to have under different conditions it will test every bit of a crew chief’s experience and knowledge, and I have the best in Rahn Tobler. “We have a good chance to move up in the points and make our run for when the Countdown to the Championship starts (Sept. 12). That’s when we want to hit our stride for those last six races. FOUR STRAIGHT: This weekend, Bristol, Tenn.; June 19-22, Epping, N.H.; June 26-29, Chicago; July 3-6, Norwalk, Ohio. 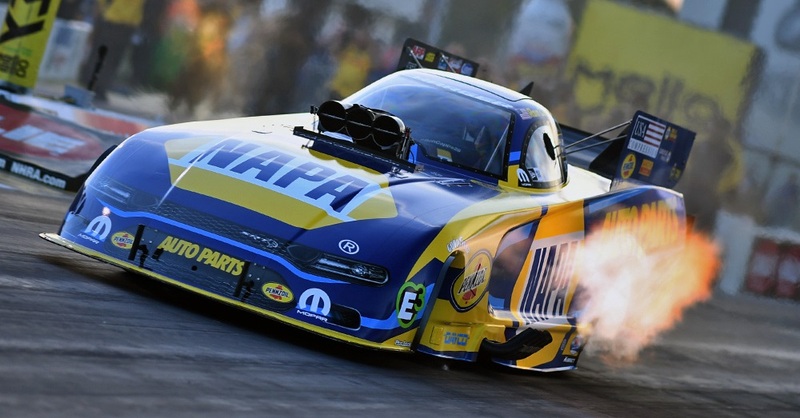 Last event Englishtown, N.J. (June 1): Qualified No. 9; lost in first round to Tommy Johnson Jr.